The global market for solder flux is heavily influenced by the sturdy rise in the manufacturing of printed circuit board (PCB), fueled by the increasing production of computers and mobile phones across the world. The significant growth in the automotive and the semiconductor industries is also having a positive impact on the sales of solder flux, reflecting positively on this market. On the other hand, the easy availability of PCB design software and the disparity in the tariffs for different regions may restrict this market from growing smoothly in the near future. However, the decrement in tariff from solder flux is anticipated to boost the demand for them, globally, over the years to come. The opportunity in the global market for solder flux, which was valued at US$213.2 mn in 2015, is estimated to reach US$367.3 mn by 2024, swelling at a CAGR of 6.30% between 2016 and 2024. Solder flux finds a widespread application in ball grid arrays (BGAs) and several other equipment such as flip chip and surface mounted devices (SMD). BGAs have been the key consumers of solder flux and are likely to remain so over the forthcoming years. In 2015, a share of more than 63% in the overall demand for solder flux was held by BGAs. As BGA is utilized in printed circuit boards of electronics and semiconductor products, the increasing demand for electronics all over the world is expected to boost their consumption in the years to come, eventually leading to raised demand for solder flux. Asia Pacific, Europe, Latin America, North America, and the Middle East and Africa are the prime regional markets for solder flux across the world. 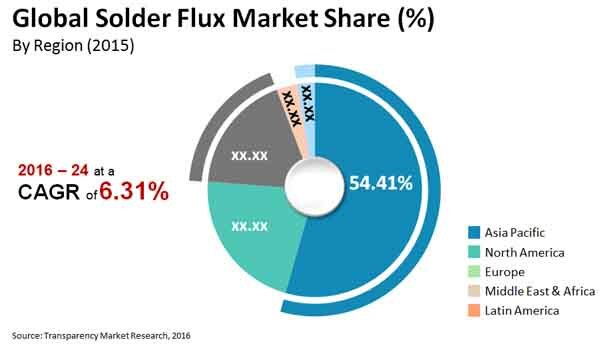 While North America and Europe, together, held the global market for solder flux in 2015, the maturing state of the North American market and the economic instability in Europe have turned the tables on Asia Pacific, which already is the most prominent individual market for solder flux. With the fast developing automotive and consumer electronics industries, specifically in China, Asia Pacific is likely to retain its position in this market over the coming years. China, among all the domestic markets in Asia Pacific, has surfaced as the key consumer of solder flux and is likely to remain seated in this position over the next few years, thanks to the steady rise of the semiconductor and the PCB industries. The market for solder flux in India is also anticipated to experience a gradual expansion in the years to come on the ground of various government initiatives, especially the “Make in India” project. The economic strengthening in China and India is anticipated to aid the market for solder flux in Asia Pacific in the years to come. STANNOL GmbH, AIM Metals & Alloys LP, Indium Corp., DUKSAN Hi-Metal Co. Ltd., Kester, Heraeus Holding, Henkel AG & Co. KgaA, Johnson Matthey, and KOKI Co. Ltd. are the key companies operating in the global solder flux market. This report analyzes and forecasts the market for solder flux at the global and regional level. The market has been forecast based on volume (tons) and revenue (US$ Mn) from 2016 to 2024. The study includes drivers and restraints of the global solder flux market. It also covers the impact of these drivers and restraints on demand for solder flux during the forecast period. The report also highlights opportunities in the solder flux market at the global and regional level. The report comprises a detailed value chain analysis, which provides a comprehensive view of the global solder flux market. Porter’s Five Forces model for the solder flux market has also been included to help understand the competitive landscape in the market. The study encompasses market attractiveness analysis, wherein end-users are benchmarked based on their market size, growth rate, and general attractiveness. The study provides a decisive view of the global solder flux market by segmenting it in terms of type and application. These segments have been analyzed based on present and future trends. Regional segmentation includes the current and forecast demand for solder flux in North America, Europe, Asia Pacific, Latin America, and Middle East & Africa. The report also covers demand for individual end-user segments in all the regions. The report provides the estimated market size of solder flux for 2015 and forecast for the next nine years. The global market size of solder flux has been provided in terms of volume and revenue. Market numbers have been estimated based on key form, and application segments of solder flux market. Market size and forecast for each major form and application have been provided in terms of global and regional markets. Secondary research sources that are typically referred to include, but are not limited to company websites, annual reports, financial reports, broker reports, investor presentations, and SEC filings, internal and external proprietary databases, and relevant patent and regulatory databases, national government documents, statistical databases, and market reports, news articles, press releases, and webcasts specific to companies operating in the market, National government documents, statistical databases, and market reports, US EPA, The Minerals, Metals & Materials Society, IEEE Technology Navigator, IPC - Association Connecting Electronics Industries. The study includes profiles of major companies operating in the global solder flux market. Key players operating in the solder flux market include KOKI Company Ltd., Johnson Matthey, Henkel AG & Company KGaA, Heraeus Holding, Kester, DUKSAN Hi-Metal Co., Ltd. and others. Market players have been profiled in terms of attributes such as company overview, financial overview, business strategies, recent developments, and SWOT analysis.